All right, I know… I’ve made these empty promises about keeping up on my blog posts before. And life always seems to get in the way of my best intentions. So I’m not gonna promise I’ll do more blog posts. I’m gonna promise that I’m going to TRY to do more blog posts instead! I figured with a new school year, and my little one finally off to Kindergarten it was time to sit down and really put some time into this thing. I’ve also decided to take it in a bit of a different direction- I mean writing about all the things that I’m sewing is great and relevant but sometimes I get so caught up in what I’m sewing and getting it done I forget to take pictures, or I just forget to write about it because I’m on to the next thing already. But I figured if I fill in some of the empty space with what’s going on in the store (ya know, kind of like an expanded version of our email with more details what not) and a few anecdotes from my personal life I should be able to fill these pages with some worthwhile stuff. Hopefully with our new and improved schedule in place (thanks to school) I will have more time to sit and sew and type and do all things ‘Fabric Marty’. As you can see, I made one pillow and then using two different embellishment techniques I made a wrap for it. Making wraps for pillows is great because it’s easier to store wraps than it is pillows or even pillow cases. I know I don’t have enough room in my house to store all my seasonal stuff! I have too much everyday stuff as it is! 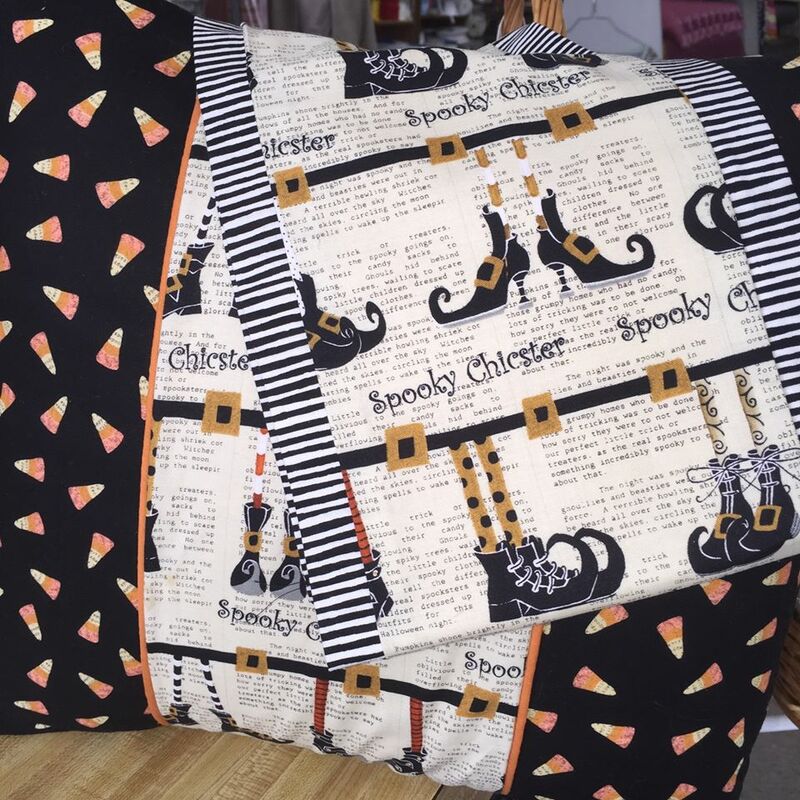 And just because I made them in Halloween fabrics doesn’t mean you can’t make them for any season. A basic beige pillow with different wraps for fall and Christmas and New Years could be even cuter and better!! Because they’re basic strips that come together and help by velcro you can use all kinds of embellishment quickly and easily and really get a lot of pizazz with not a lot of effort or energy. In mine I’ve used packaged piping on the edge of one and then I used a ‘flange’ technique on the other. But for holidays things like cording or lace trims could be put on there to keep it interesting and fun! And since it’s small pieces, you probably have everything you need to make them. At the store we carry pillow forms in a variety of square sizes. Although you do not necessarily need to buy a pillow form and make a pillow for a wrap…. Why not consider making wraps for pillows you already own?? 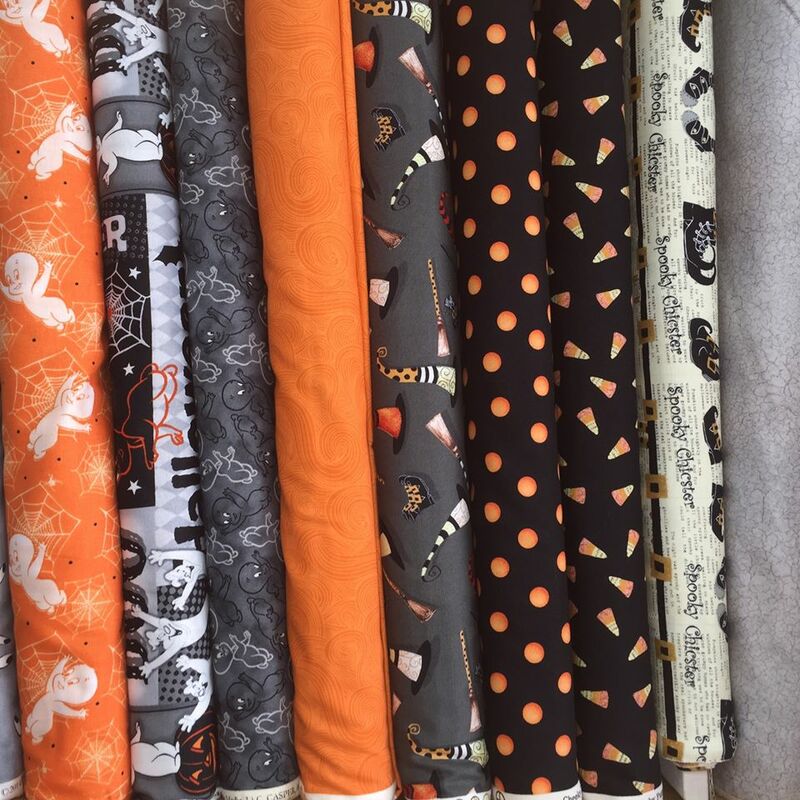 And here's a little peek at our latest Halloween Fabrics!